It’s been a long time since I cooked something from the sea and today I decided to surprise my wife with something homecooked, delicious and all the sea food she loves all in one pot.. 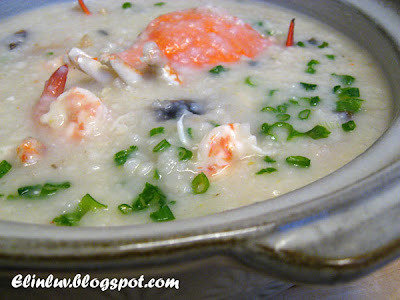 I decided to cook the family favourite which is the Seafood Rice Congee or simply Seafood Porridge as is commonly known in our town. So I decided to make a quick trip to the supermarket to select some fresh sea offerings. Nothing beats the sweetness of fresh sea produce especially crabs, prawns and brown sea octopus. For my signature dish today I chose two medium sized soft shell sea crabs, the locals here also calls it flower crabs as the shell has a distinctive flowery design . My preferred choice would have been the black hard shelled crabs but since these were not available I decided on the next best alternative. Next on my shopping list is shrimps as my American friends calls them though we refer to it as prawns. I chose some medium sized ones about 200 grams. I looked around for a small brown octopus about 100grams size. I got what I wanted as regards the seafood and now for some other ingredients. I needed some fresh green spring onion leaves a small bundle would do and some garlic cloves. Preparation skills is rated about medium as care is needed to cook a correct texture for the congee. I measured one and a half cups of rice and about 8 rice bowls of water , add about 8 pips of garlic and 2 teaspoons of sesame seed oil and a teaspoon of salt This was put to a rolling boil and later brought to a very slow simmer. You need to constantly stir the congee to ensure it reaches the correct texture so stir a bit every 15 minutes. Do this for an hour and you are almost done. When the texture is just about correct you add in the soft shell crabs followed by the prawns and the slices of brown octopus. Cover the pot and simmer for 15 minutes on low heat and add 3 teaspoons of Kikkoman sauce and you are ready to serve. Garnish each serving with some chopped spring onion leaves and some pepper or Chinese wine to taste. 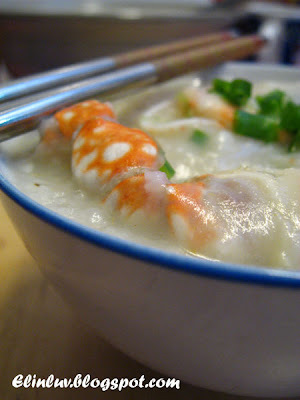 I have now shared with you how to make a fairly easy and tasty seafood congee especially suitable for breakfast on a weekends. I enjoyed my share of the congee with a glass of Chivas Regal as I am a little allergic to seafood and the whisky is a good antidote and works. 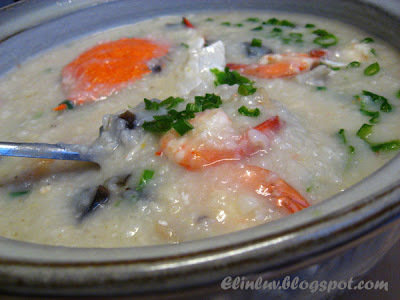 Hope you all like this seafood congee and I hope I will be invited more often! I'm sure Elin would love to allocate, say ... Father's Friday, a weekly column for you to vent your culinary skills. Elin, you're so lucky. 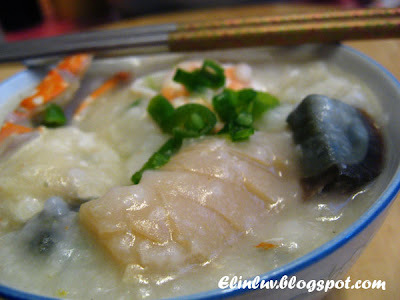 Your husband can cook well, the seafood congee looks so delicious. Hope one day I can be your guest. wow...whats the black thingy there? Century Egg? 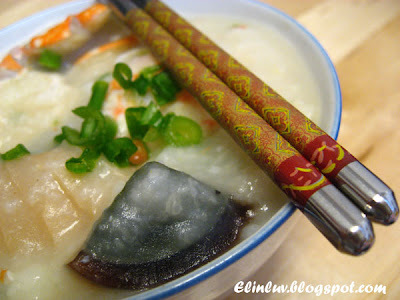 Elin, lucky you, you have acute husband and also he know how to cook, envy you lar..anyway, this congee look so delicious, wish I can try out next time. oh, perfect job! so lucky for elin to have such a sweet husband. 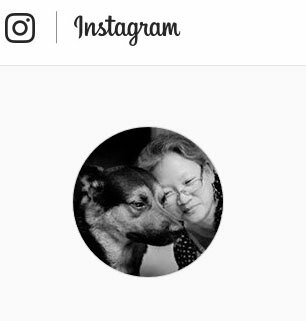 Elin, your husband is so cute and he writes really well too and not to mentioned can COOK!! Maybe it is time to pass your apron to him or maybe he should start his own cooking blog. Wow, you are a lucky woman! So sweet to have hubby cooks for you. Really yummy congee. oh yum yum yum Elin!! Wow, your other half won't suffer from starvation should you ever go on strike! I wish my wild boar would cook something like this for me too! Elin honey, you can retire already! Just gift your apron to your handsome 'boar' and shake legs! haha.... Btw, who is cleaning up the mess in the kitchen???? There's a big question mark here! Wild Boar : " Oink oink , thank you for dropping by to read my humble post "
Gertrude: Haha he is funny at times, he can cook and he can writes too. Yup good idea to hand over my apron to him . But I still have to do the washing and cleaning up the mess he leaves behind ,so on second thoughts better not Lol! Cheah : No he won't...coz Iknow he will know how to enjoy good food when I am gone lol! pigpigscorner : haha I am sure yours will be able to cook for you too...teach him and I know for sure he will surprise you one of these day! Oh. How. I have missed you and your amazing food. This looks mouthwatering!! Elin, you shall allow your other half to write here oftener....and lucky you! He can even cook! Respect!